"He loved his job, and everything he achieved was through his own hard work, his own talent and perseverance," says Violetta Stakhanova, the daughter of Alexei Stakhanov. Stakhanov was a miner in Donbass, a coal-producing region in Soviet Ukraine. Under the communist system, all mines were run by the state and had monthly production targets. If they missed the targets, local managers and Communist Party officials were in trouble. 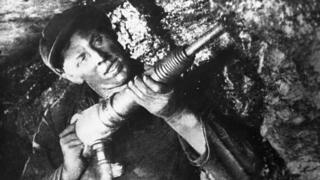 The mine where Stakhanov worked was one of the worst-performing in the region. "He was incredibly competitive. He kept thinking how to increase the productivity of his mine - and eventually he came up with a brilliant solution," says Violetta. In the 1930s, miners used picks to work the coal, which was then loaded on carts and pulled out of the shaft by pit ponies. Lying on his side or his back, a miner would hack into the coal. He also had a set of pit props - logs cut to different lengths - and from time to time, he would prop up the roof of the tunnel where he worked. Stakhanov came up with the idea of having one miner constantly picking coal, while another loaded the coal on the cart, a third miner propped the roof with pit props, and a fourth led the pony in and out. And instead of the traditional pick, Stakhanov was keen to use a mining drill, which was a novelty and required specialist training. Drills were extremely heavy, weighing more than 15kg. "He went on a course, and he learned to use that drill," says Violetta. "He had no education beyond primary school - but when it came to his job, he was determined." Once a gang of local workers threatened my dad with a knife. 'Why are you trying to impose new targets on us?' they said. The manager of the mine had serious doubts about Stakhanov's initiative. However, Stakhanov persuaded his team leader and the local party boss to give it a go. On 30 August 1935, at 22:00, Alexei Stakhanov and three colleagues entered the mine, accompanied by the party boss and a local journalist. Six hours later they emerged, triumphant, having produced 102 tonnes of coal - more than 14 times the target. Stakhanov was instantly lavished with attention and praise: a delegation of local women presented him with flowers, the local paper published his story and the Soviet minister of industry, Sergo Ordzhonikidze, showed the story to the Soviet leader Joseph Stalin. Before long, an article praising "the Stakhanov method" appeared in the central party newspaper, Pravda. Once it was approved by Stalin, the method started spreading throughout the Soviet Union. "My dad was rewarded with a small furnished flat, and even a horse with a cart to travel around, because in those days they didn't have cars. Dad was particularly proud of the horse," says Violetta. Image caption A photo with the message "Outstanding miner of Donbass Alexei Grigorievich Stakhanov improved on his own record and in 6 hours of work using a Soviet drill he produced 175 tonnes of coal"
But she remembers one story her father told her showing that not all of Stakhanov's colleagues welcomed his achievements. "Once a gang of local workers threatened my dad with a knife. 'Why are you trying to impose new targets on us?' they said. 'We had a good life without your initiatives!'" But Stakhanov fought them off. With the support of the Communist Party, he started travelling around the Soviet Union, promoting his initiative. Unable to cope with his celebrity status, his girlfriend, a Roma Gypsy woman called Yevdokia, left him for another man. She left their two children with Stakhanov, thinking that they might have a bright future with their celebrity father. But touring the country, Stakhanov was not short of female attention. Once he was visiting a school in the city of Kharkov, where pupils gave a concert to welcome him. When a girl called Galina Bondarenko came onstage to sing a song, Stakhanov lost his head. In no time at all, they were married. Galina was half Stakhanov's age, from a well-educated but poor family. After the wedding, she went back to school and continued her studies. "My dad adored her," Violetta says of her mother. "She didn't exactly love him, but she respected him, like an elder. I don't think she was passionately in love with him, the way some women are with their men." Over the next few months, travelling around the country, Stakhanov recruited thousands of supporters from all branches of Soviet industry and agriculture, who were happy to apply his ideas to increase productivity. In November that year, the First Conference of the Stakhanov Movement gathered in Moscow. A reporter from Time magazine attended the event. A new word was born - Stakhanovets, in English "Stakhanovite" - meaning a person who works extremely hard. Thousands of happy workers wiped tears of joy away as they listened to the Soviet leader, Joseph Stalin, give his address to the conference. Image caption A 1936 poster, designed by Gustav Klutsis, with the slogan "Long live Stalin´s tribe of Stakhanovite heroes!" "Life has become easier, comrades, life has become happier. And when one is happy, work goes well. If our life was hard, sad and joyless, we wouldn't have had the Stakhanovite movement." Stalin's speech was greeted with passionate applause. Decades later, Russians remembered Stalin's words about "life becoming happier" with sarcasm - for most Soviet citizens, the 1930s turned out to be a time of starvation as well as brutal repression. But for Alexei Stakhanov things were indeed looking up. The Communist Party gave him an elite flat in Moscow and a job in the coal ministry. His beautiful young wife, Galina, helped him to navigate the Machiavellian politics of the Soviet capital. "Once, at a reception, Stalin introduced my mum to everyone - she was always elegantly turned out - and he said: 'Pleased to introduce you to the wife of our future government minister." My dad nearly fainted. He was terrified. Mum told me later that she had to hold his hand to calm him down. Eventually, Dad said, 'Thank you for the honour, but I don't have enough education,' you know, that sort of thing." Life in Moscow had other dangers. One day Galina was out shopping when she noticed a car following slowly behind her. The vehicle drew alongside and an officer politely asked her to step inside. She did so, though the officer refused to reveal their destination. She was taken to the mansion of Lavrenty Beria, one of Stalin's most feared associates. In the 1930s and 1940s, Beria used to send out his assistants to kidnap beautiful women from the streets of Moscow. Galina had obviously caught his eye. "She walked in, and another officer came out to meet her," says Violetta. "She said, 'I am Stakhanov's wife, and I am pregnant. I don't know why I am here.' The officer was very smart, he called someone straight away and they let her out and drove her home within minutes. Afterwards, Dad was furious and said to her, 'How could you get into the car with them? You know what they do to women!'" In his 20 years in Moscow, Stakhanov never quite got used to his complicated new life and missed his former colleagues. In 1957, four years after Stalin's death, the new Soviet leader, Nikita Khrushchev, saw no need to keep Stakhanov in Moscow and ordered him back to Donbass. Stakhanov felt he was in a virtual exile - especially since his family remained in Moscow - and spent the last 20 years of his life drinking heavily. Violetta remembers her father was particularly upset that it took the Communist Party 35 years to give him the highest Soviet award, the Hero of Socialist Labour. He received the medal in 1970. Alexei Stakhanov died after a stroke in Donbass, in eastern Ukraine, in 1977. A city in the region is named after him. Violetta Stakhanova spoke to Witness - which airs weekdays on BBC World Service radio. Subscribe to the BBC News Magazine's email newsletter to get articles sent to your inbox.